Do you all remember those old Pace Picante commercials with the cowboys? Someone tries to hand a cowboy a jar of salsa and he hollers, “This stuff’s from New York City!” The other dusty cowboys in the group respond in harmonized, exaggerated disbelief, “New York City? !” Every time that commercial came on when I was a kid, my dad and brothers would chime in and crack themselves up. I’m planning my first trip to New York City at the end of the month, and every time I think about it, I hear those cowboys and my family’s voices echo in my head, “New York City?!”. A couple of months ago, when I was in San Antonio, I met a girl my age who was visiting Texas for the first time. As someone who grew up just half a state away from that behemoth, it was a bit of a shock to realize that not everyone has been to Texas. I’m sure that’s how many East (and West) coasters feel about the fact that I’ve never been to the country’s most iconic city. I’ve always wanted an excuse to visit, so when Saveur Magazine invited all the Best Food Blog nominees to a little soirée (their terminology, not mine), I rounded up a friend and bought tickets. Although I’ve been to my fair share of big cities and I’m ecstatic that I finally get to visit NYC, I am experiencing a bit of trepidation as well. I blame those cowboys! Growing up, we ate quite a bit of Pace Picante from San Antonio, but not while my dad was on a salsa-making kick when I was in elementary school. We’d stand around in the kitchen, taste testing the salsa and suggesting more lime or vinegar. That may have been my first real cooking lesson, if you can call it cooking. A few years later, my youngest brother, Zane, and I held competitions at the kitchen table to determine who could tolerate the spiciest salsa. Pretty sure I always won. After my grandmother passed away during college, my family and I escaped to Playa del Carmen for a week, during which time I fell in love with a Mexican condiment—pico de gallo. I put it on everything, from salad, pasta, toasted bread to the more obvious chips and tortillas. This Saturday, which happened to be Cinco de Mayo, I spent the day with my family celebrating my brother Reed’s college graduation. We snacked on what very well could have been Pace Picante an the reception while I marveled, once again, at how grown up (and good looking, good grief!) my little brothers have become. 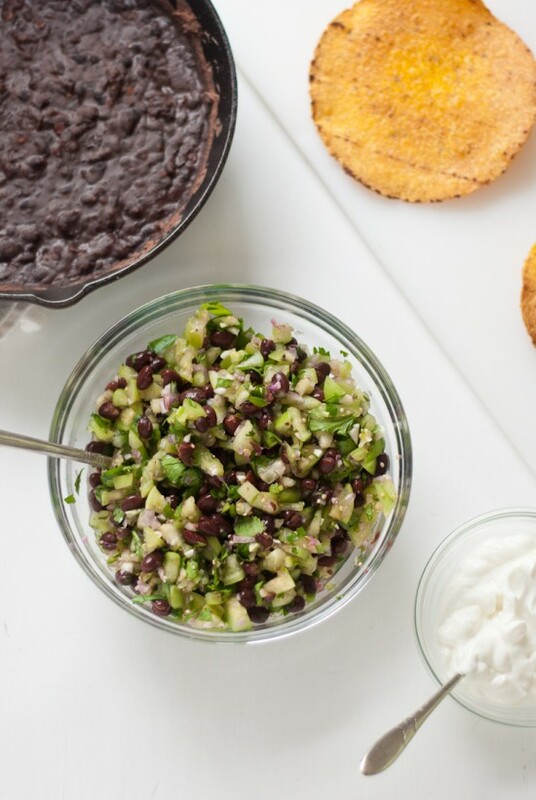 This tomatillo black bean salsa is too late for Cinco de Mayo. No matter, I’ll happily agree to Mexican food and margaritas any day of the year! Alissa of Big Eats Tiny Kitchen, who I am glad to call a real-life friend, picked out a versatile salsa recipe for this week’s installment of The Food Matters Project. I chose the fresh tomatillo and black bean variation and couldn’t be happier with the way it turned out. It’s light and refreshing, perfect for warm days. 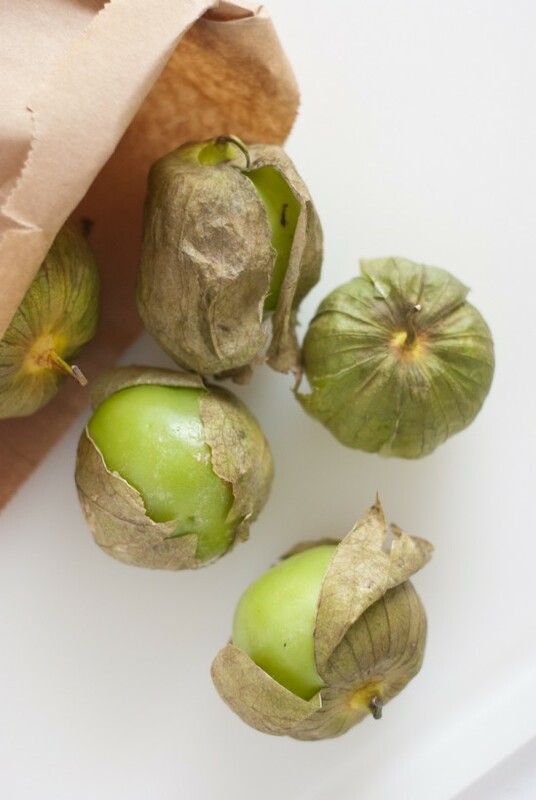 This was my first time to buy tomatillos; their rough, papery husks made me hesitant to pick them up. Behind their crinkly exterior belies smooth, bright green skin and tart, apple-flavored flesh. 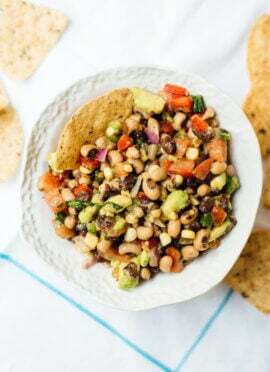 Zesty lime juice, garlic, scallions and jalapeño punch up the salsa, while earthy black beans ground the brighter flavors and lend substance. It’s a sweet and spicy spin on traditional pico de gallo, which makes it a perfect burrito bowl or quesadilla filling. 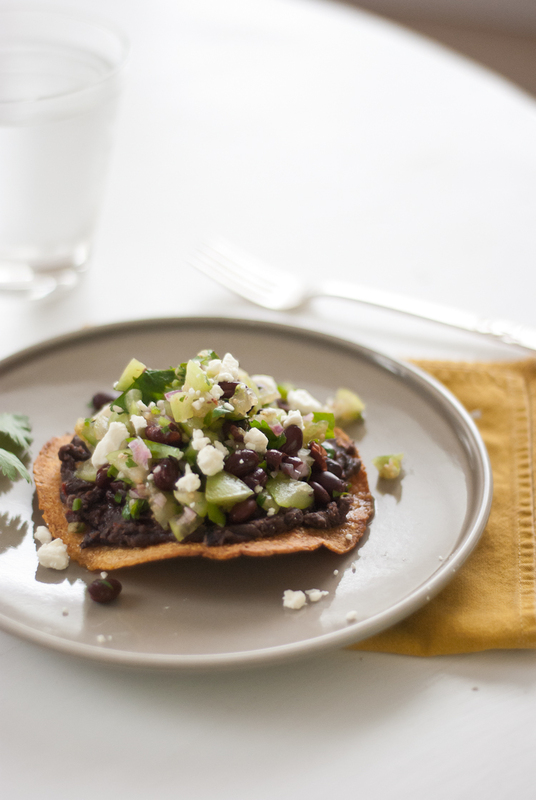 My favorite way to enjoy it is piled high on a baked tostada with a sprinkling of salty, crumbled feta cheese. You’ll find the recipes below! 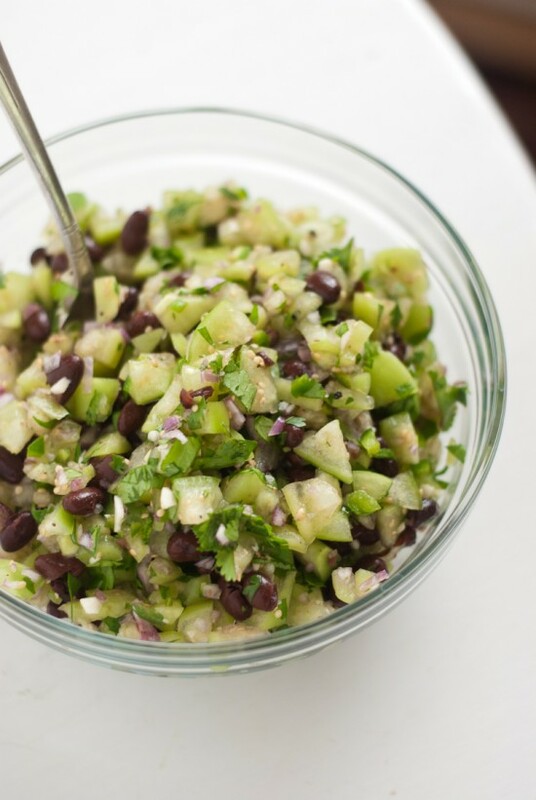 Fresh tomatillo and black bean salsa is a delicious twist on traditional pico de gallo. This salsa is great on tostadas (recipe included), burritos, salads and more! Toppings: crumbled feta cheese (highly recommended), diced avocado, sour cream or plain Greek yogurt, red pepper flakes and/or more cilantro. To make the salsa: In a medium bowl, combine all of the prepared ingredients. Taste and adjust the seasoning if necessary (more lime juice, salt and pepper, etc.). Cover the salsa and let it rest for at least 30 minutes in order for the flavors to meld and the beans to soak up the surrounding flavors. To make the tostadas: Preheat the oven to 450 degrees Fahrenheit. Spray each tortilla with cooking spray on both sides (I used organic olive oil spray) and place on a baking sheet in a single layer. Bake for about ten minutes, until golden and crispy. In a skillet over medium heat, pour in a little drizzle of olive oil. Add black beans and their cooking liquid, and mix in some hot sauce and red pepper flakes. Mash the mixture with a potato masher for five minutes or longer, until the beans have reduced to your desired consistency. (This is the lazy way to do it, if you’d like to go all out, make the beans as directed in my chipotle-glazed squash recipe). Spread bean mixture evenly over each tortilla and top with tomatillo salsa. Finish with your selected toppings. Pick it up with your hands or be fancy and eat it with a fork. Salsa barely adapted from The Food Matters Cookbook by Mark Bittman. Tostadas roughly adapted from The America’s Test Kitchen Healthy Family Cookbook. 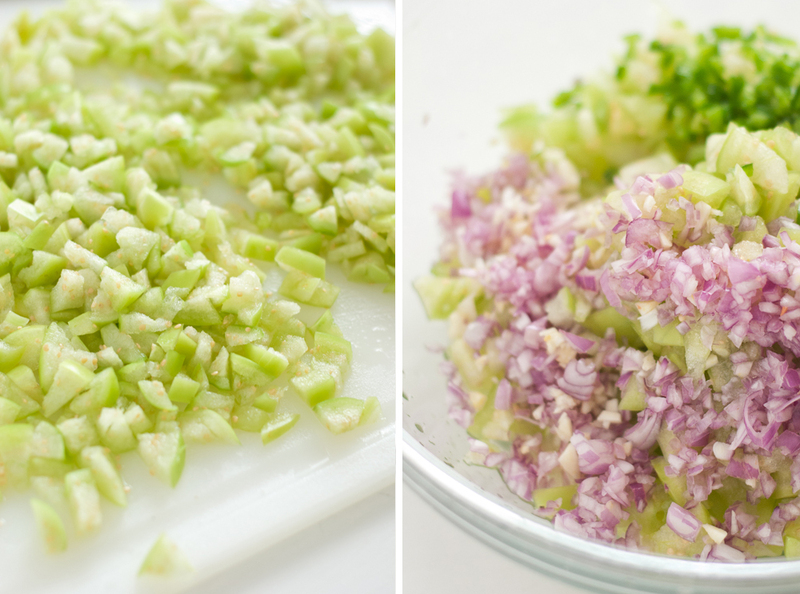 Change it up: Feel free to sub pico de gallo or any other fresh salsa for the tomatillo salsa. For inspiration, check out Big Eats, Tiny Kitchen! If you want the really lazy variation, just skip the black bean mixture altogether since the salsa already has beans in it. It’s like a big baked chip with salsa and cheese—you can’t go wrong! I could hear those appalled, “this stuff’s made in New York city”, cowboy voices as I read your words. Pretty effective ads – I don’t think I can look at a bottle of Pace without thinking of those commercials. Tostadas look delicious – we’re on a Mexican food kick right now and will try these. Thanks! Loved that commercial growing up. You’re gonna have a blast in New York City! I can’t wait to see all the pics. Why am I not remembering those commercials?? Then again, I’m a visual person, so there isn’t a chance. And speaking of a visual, I think you nailed the tostada, so not to worry :) it’s hard to get delicious mexican food looking good for the camera, it’s always just a happy fresh mess most of time. But this, this looks great Kathryne. :) so delicious I’m sure. Have fun in New York! I’ve always been curious about tomatillos but somehow never tried it. Now I’m so curious to try them. I love your pictures! There’s something so mesmerizing about the way you photograph your food. I need to learn from you. Beautiful photos! Your meal looks wonderful. 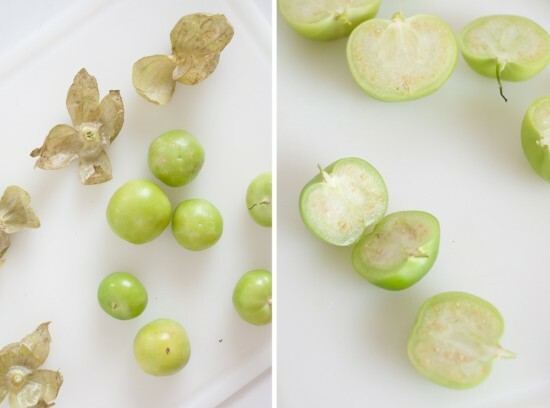 I have always cooked tomatillos for salsa (and did this time also) but I ate several bites of the raw tomatillo and love the fresh green apple taste! Black beans and tomatillos didn’t sound so great too me so I went with tomato salsa. Now that I see your salsa my mouth is watering and I wish I had made it. Next time. Your pictures are beautiful! 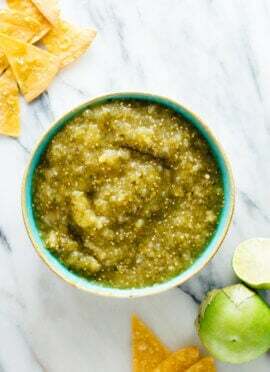 I love tomatillos and your salsa looks great. I just finished planting tomatillos in the garden and I can’t wait for summer. Meeeeercy me all mighty LOU, that looks so good. 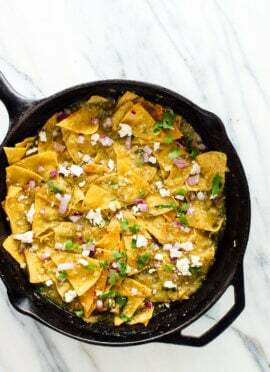 From the tomatillo salsa to the baked tostadas, this looks like one amazing meal. I’m ready for dinner! “Get a rope.” Ha! I loved those commercials. I’m so excited for you to get to travel up to NYC! And I love the salsa verde version you created. Mmmmm. I don’t think I ever had tomatillos- I should give it a try! We eat tostadas all of the time! We have a great black bean sweet potato recipe on our site:) I am making your recipe next time though! YUM! Watching your little brothers and sisters grow up is amazing, how they change over the years and become independent. I love my brothers and my sister :-) and I love the look of your salsa. I am making something similar again tonight, can’t have too much mexican food. This sounds so yummy! Awesome idea! Hello, yum! Have so much fun at the soiree. I bet you’re going to meet all kinds of famous, fabulous people! I remember those commercials as well and I’m one of “those” that have never been to Texas! I’ve lived in FL my whole life but have been to NYC. You’ll love it! Have a blast!! AND this recipe looks amazing! How do I love everything you come up with!?!? Might try this over the weekend! Great recipe. I love the flavor of raw tomatillos. Sometimes I also add chopped carrots to my tomatillo salsa. being from the philadelphia area i am somewhat negative in my outlook toward NYC, but this place is awesome. you won’t be disappointed. Thanks so much for the recommendation, Christopher! Peacefood sounds right up my alley. I added it to my little list of restaurants to try in NYC, hope I can make it there! Anything with tomatillos is delicious. I’m a huge fan! does the tomatillo salsa have onions in it? I see them in the pic but not in the recipe. Thanks! Good question, Jessica! What appears to be purple onions in the salsa is actually chopped shallot, which is in the recipe. You could definitely substitute 1/3 cup chopped purple onions for the shallot if you’d like! I’m a little late to this post, but so glad you’ll be coming to NYC! Can’t wait to meet you at Saveur. Delicious! I stumbled upon your blog last week and found so many delicious recipes I could not wait to try. I made this one for friends Tuesday night and we could not believe how great it was. They said we should quit going to Mexican restaurants it was so good! Kate, this looks so yummy! Perfect to go with a margarita (or two)! I made these tonight!! They were so so delicious and pretty easy/quick. I had never used tomatillos either, but I’m so happy that I tried them, the salsa was so light and refreshing, perfect after a day of insane heat, haha. Thanks for the recipe! Hooray, I’m happy to hear you enjoyed the tostadas! Thank you for letting me know! Kate, I stumbled on this recipe during my pantry/fridge clean-out. I was looking for something to do with my tomatillos. I was missing a couple of ingredients but managed to use a couple substitutes (red onion for the shallot, and lemon juice for lime juice). Then I noticed I did not have another can of black beans so I used the green goddess hummus (again, using subs) as my bean base on the tostada and man, it still came out great! Thank you for some great vegetarian options. I have been feeling so alive since I have started my gradual switch. Hi Tracey! Thank you so much for your comment. It made me smile. Thank you for catching that typo, too. It’s been there for four years now! Yikes! Usually, my mom catches them. That’s the only way I know that she reads my blog. :) Delighted to hear that you both are enjoying my recipes. Please thank your friend for me, for sending you my way!